The Langham hotel, within credit card throwing distance of the shops of Oxford Street, enticies with its Chuan Spa, fine dining restaurant, glamorous cocktail bar, and Palm Court, famed as the place where the tradition of afternoon tea was born. This five star hotel near Regent Street is a very special place to stay. A lavish £80m refurbishment reasserts the brilliance of this Victorian hotel first opened in 1865 - the first grand hotel in London and possibly the most stylish. Roux at The Landau restaurant and Artesian cocktail bar are stunning (thanks to architect David Collins) while the Palm Court makes the perfect place for afternoon tea. The grand ballroom, Chuan Spa and 16-metre indoor swimming pool add to the feeling of luxury but also confirm this as a very special place to stay. Afternoon Tea has been sipped at the Langham Hotel since the mid-19th century. There's a long tradition of taking tea at the Langham Hotel. Afternoon Tea has been sipped here since the mid-19th century, originally served for the princely sum of 1/6d (now 7 1/2p) to the cream of Victorian society. Following a lavish £80m refurbishment, this landmark hotel - the first grand hotel in London - serves up tea, once again, at the Palm Court restaurant. Lavish is an appropriate word. Thanks to elaborate designs by architect David Collins, you can enjoy your tea and cake in sumptuous crystal chandelier lit surroundings, perched on plush velvet seats. An almost ridiculous level of attention to detail means the day's progression is marked by subtle changes in lighting, linen, chinaware and the staff uniforms. An aroma of ginger flower wafts over perfumed teas and delicate cakes while live piano music plays in the background. There are over 30 blends of tea to choose from including home grown tea and pre rain Jun Shan (Imperial Mountain) silver needle yellow tea at £40 a pot. With a nod to the year the hotel was first built and the date of its subsequent re-opening, Champagne Hour then runs from 18:65 hours to 20:09 (roughly 7-8pm). The transition from day to evening is marked with candle light and the discrete pop of corks - with over 40 Champagnes by the glass featured. Utterly decadent and delightful. You'll eat your breakfast off Vera Wang crockery when you dine at The Landau at The Langham Hotel. You'll eat your breakfast off Vera Wang crockery and exchange your coat for a tag designed by Bill Amberg when you dine at The Landau at The Langham Hotel. It's that kind of place. The kind of place that has plush, thick-pile carpets and a 'service philosophy' which includes black napkins to go with the ladies' little black dresses. Bring your appetite with you if opting for their speciality 'tasting' menu - you can make your way through up to eight courses, best taken with wine pairing. The kichen is in the safe hands of the famous Roux family; Albert and Michel Roux Jr have appointed their protege Chris King as chef - a rising star who has worked at Le Gavroche for the past five years. His cooking style and the menus reflect the Roux trademark - think classically-constructed French dishes cooked with a lighter touch. Specialities include roast rack of Romney Marsh lambwith carcked wheat, marjoram and olives, chorizo filled rabbit leg with langoutines, and roast fillet steak with seared onions and wild garlic bearnaise. Food that has been so carefully laboured over it could be described as modern art, served in a deluxe setting at eye watering prices. One of London's most glamourous hotel cocktail bars. Enjoy dominoes and daiquris on Mondays from 5pm or sax on Saturday nights from 8pm at one of London's most glamourous hotel cocktail bars. When the landmark Langham, one of London's oldest hotels, celebrated its 140th anniversary in 2007 it was in the middle of a £50 million David Collins-design facelift. The Artesian kept its name but emerged more splendid and opulent than before. Where else would get "energised ice" that's "purer, colder and denser than regular ice"? If you think you don't need such fripperies clinking around in your cocktail, think again. It makes the drinks more potent. Building on the history of the British tavern, The Langham has an elegant pub next door. Chuan Spa, based at The Langham Hotel, is the ultimate in spa and wellbeing experiences. 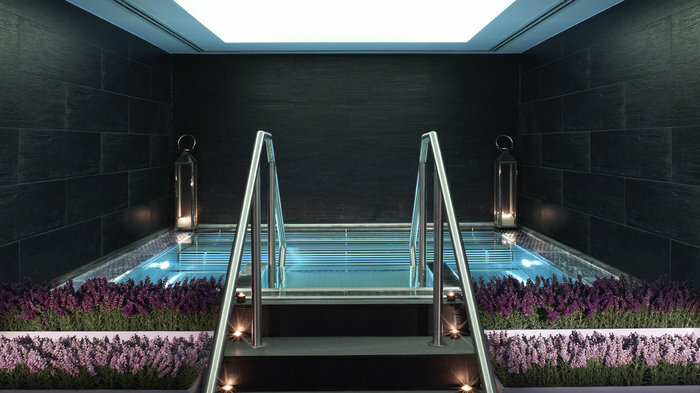 Chuan Spa, based at the Langham Hotel, is the ultimate in spa and wellbeing experiences. Designed to create a tranquil atmosphere to maximise relaxation, Chuan Spa offers a luxury haven in the heart of the bustling capital. In English, the word 'Chuan' means a 'serene course of water' - entirely appropriate seeing as, in Chinese culture, flowing water is seen to be the source of life and balance. The spa's philosophy is steeped in the values of traditional Chinese medicine and guests can transcend into an almost ethereal state of relaxation with therapies designed to re-balance and revitalise the body and soul. With six private treatment rooms, including a couple's spa suite, pre and post treatment area, vitality pool and herbal steam rooms and saunas, Chuan may be the perfect place to unwind after yet another hectic week. From cheap budget places to stay to luxury 5 star hotels see our special offers for hotels, including Radisson Blu Edwardian Kenilworth Hotel from 59% off.